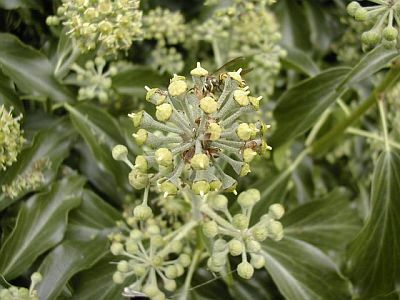 This plant in my garden is a sort of flowering upright ivy (at least I think it is). Now, I hate most ivies because of their tendency to take over everything as soon as you go inside, but this one was redeemed for two reasons. The flowers. And the fact that wildlife seems to like it. Ivy is a wonderful plant for wildlife – 3 moths (willow beauty, herald, and swallow-tailed moth) and holly blue butterflies love it. You may get butterflies overwintering in it and yes wasps love it too but here’s a plea on behalf of wasps – they’re useful, we really need them and they’ll be too busy sucking up all that nectar to bother much with you. Birds love the berries which are an important source of food for them during winter. We had a magnificent ivy plant growing over our garden outhouse but the main stem was in our neighbours garden and they chopped it down. I still miss it and writing this has reminded me how much I would like to replace it!